Multi Buy Promotion Deals - Save Money Buy In Bulk !! Bolsius Pillar Candle Ivory Box 4. High Quality Bolsius Product. 60mm x 40mm Pillar Candles. Each candle is 60mm tall x 40mm wide. Ivory Colour. Perfect for smaller holders like votives or glass bowl decorations for centrepieces etc. 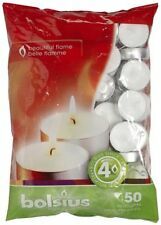 2 x BOLSIUS PREMIUM BAG OF 50, 8 HOUR BURN TEA LIGHT TEALIGHT UNSCENTED WAX CANDLES. Bolsius Pillar Candle. Colour: Anthracite Grey. NEW BOLSIUS PILLAR CHURCH ALTAR CANDLE. Height 100mm. Width 100mm. Made from parrafin wax. The candles are a eye-catching design that can accent any interior. On its own or grouped together these rustic candles are ideal for use in larger rooms, such as living rooms and kitchen-diners. Long Burn 4 Hours. Material: Wax & Aluminium Cup. Perfect for events or long evenings. Long Burn 8 Hours. Material: Wax & Aluminium Cup. Perfect for events or long evenings. Size: 38mm. Still in shrinkwrap but has small dent at upper back edge. Our white floating candles are everything you were looking for and they fit your needs wonderfully! The design of this product is specially made for you to float these white candles in every jar since they fit perfectly. Unscented long burning tealight candles 6 hour great for restaurant candles. high quality tealight candle 6 hour bag of 100 candles. tea candles great for parties wedding restaurant and all events. Color: White. Tea Light Candles – Set of 100 Unscented Candles – Long Burning Candles – Party Candles – Tea Light Ambience Candles – Restaurant Decorations. high quality tealight candles 100 count tea lights burns aprox. They look lovely and your guests will surely exclaim over this elegant centerpiece. Our white floating candles are everything you were looking for and they fit your needs wonderfully! The design of this product is specially made for you to float these white candles in every jar since they fit perfectly. Bolsius 8 hour burning Tealights, Bag "50"
5 out of 5 stars - Bolsius 8 hour burning Tealights, Bag "50"
81 product ratings81 product ratings - Bolsius 8 hour burning Tealights, Bag "50"
Bolsius tealights allow you to create an ambiance in any room, quickly and easily. High quality safety and Burn. Material Paraffin Wax. Ideal for use in oil and wax tart burners. Special Features Tea Lights. Size:100 Bolsius high quality tealight candles 100 countBolsius tea lights burns aprox. Bolsius high quality tealight candles 100 count. Bolsius tea lights burns aprox. Manufacturer: Bolsius. Manufacturer: Bolsius. BEST MATERIALS: This Bolsius 3 wick ivory pillar candle is made of the best wax and high quality cotton wicks. It is wonderfully crafted so that you can enjoy a simple yet elegant and romantic party. BOLSIUS Tea Light Candles – Set of 100 Unscented Candles – Long Burning Candles – Party Candles – Tea Light Ambience Candles – Restaurant Decorations. Size:100 Bolsius high quality tealight candles 100 countBolsius tea lights burns aprox. Our white floating candles are everything you were looking for and they fit your needs wonderfully! Just decorate the bowls or jars and you will get the perfect image. Would you like to try a different product to achieve a better result?. Why should you order this product?. Our white floating candles are everything you were looking for and they fit your needs wonderfully! The design of this product is specially made for you to float these white candles in every jar since they fit perfectly. These tea lights are also perfect for use in oil and wax tart burners. • Great for Oil Burners and use with Wax Tarts. • Place in appropriate Candle Holders. • Great value. 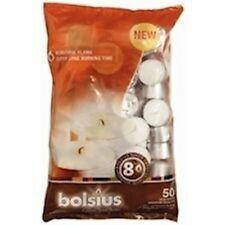 BOLSIUS PREMIUM BAG OF 50, 8 HOUR BURN TEA LIGHT TEALIGHT UNSCENTED WAX CANDLES! 5 out of 5 stars - BOLSIUS PREMIUM BAG OF 50, 8 HOUR BURN TEA LIGHT TEALIGHT UNSCENTED WAX CANDLES! 81 product ratings81 product ratings - BOLSIUS PREMIUM BAG OF 50, 8 HOUR BURN TEA LIGHT TEALIGHT UNSCENTED WAX CANDLES! Bolsius tealights allow you to create an ambiance in any room, quickly and easily. Ideal for use in oil and wax tart burners. Model Number: 103630519700. 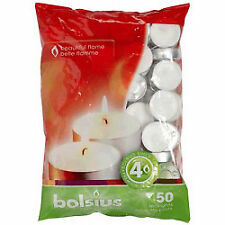 5 x BOLSIUS PREMIUM BAG OF 50, 8 HOUR BURN TEA LIGHT TEALIGHT UNSCENTED WAX CANDLES. Marke Bolsius. Tealights with long focal length are ideal for festivals, for gastronomy. The best alternative if you do not ever want to change the tealights. Once infected the evening and the candle burns all night! Manufacturer: Bolsius. Marke Bolsius. Wick Colour: white (instead of green). Super tea lights for use in a Lantern for optimum warm candle light. Perfect for any table decorations. Wax Color: White. Manufacturer: Bolsius. Marke Bolsius. Case: aluminum dish. Super tea lights for use in a Lantern for optimum warm candle light. Perfect for any table decorations. Height: about 22 mm. State: New. What sets us apart. Bolsius tealights allow you to create an ambiance in any room, quickly and easily. High quality safety and Burn. In case of any problem we will help. 100% Support! Receive it within 24 hours from order!